Charles B. Bryant. AQUATIC HARVESTING APPARATUS.USA, 4258534[P].1979-3-7. James L,Hawk. Apparatus for remocal of aquatic plant growth:USA,5069023[P].1992-10-10. Thomson Sinkala, Enala T. Mwase , Mick Mwala. Control of aquatic weeds through pollutant reduction andweed utilization: a weed management approach in the lowerKafue River of Zambia. Physics and Chemistry of the Earth,002,(27):983-991. D. G. Cross. Aquatic Weed Control using Grass Carp.Journal of Fish Biology,anuary 1969, 1(1):27-30. Brian J. Midtling et al. 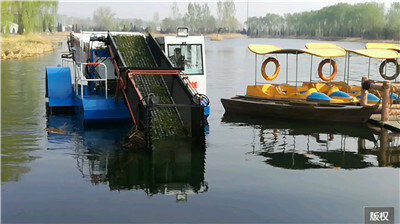 Method and apparatus for harvesting aquatic plants. U.S. PATENT DOCUMENTS,13 Sep 1991, 5197263. Andrew J. Rodusky, Bruce Sharfstein, Therese L. East and Ryan P. Maki. A Comparison of Three Methods to Collect Submerged Aquatic Vegetation in a Shallow Lake. Environmental Monitoring and Assessment，110(1-3):87-97. T. RAMAPRABHU AND V. RAMACHANDRANl. Developments in Aquatic Weed Control Research in India Relating to Fisheries. J. Aquat. Plant Manage,1984,(22): 97-100.